For use with Trick Flow® Twisted Wedge® and Twisted Wedge® Track Heat® cylinder heads only. Save money for other upgrades by purchasing only the gaskets you need for a cylinder head swap or reseal with a Trick Flow premium head gasket set. 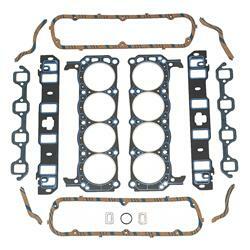 The sets include steel core head gaskets, composite intake gaskets with end seals, steel core laminate exhaust gaskets, and premium valve cover gaskets.